Condition: We are pleased to offer for sale a beautiful set of Diamond Harding Blue stretch glass candlesticks. This style is referred to as the spindle style. Our candlesticks are in Undamaged Condition without chips, cracks, or mold damage. The color is awesome. The Iridescent effect is great. 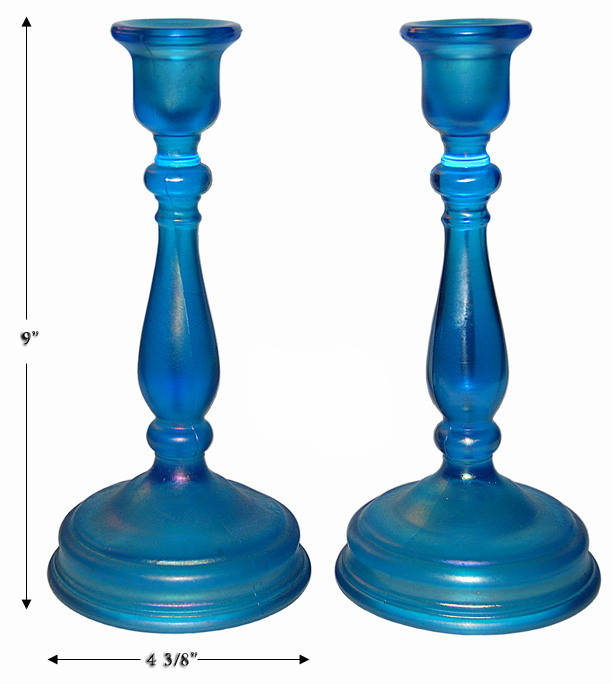 Measurement: 9" H. - 4 3/8" W.
Condition: We are pleased to offer for sale an beautiful set of Diamond Harding Blue stretch glass candlesticks. This style is referred to as the spindle style. 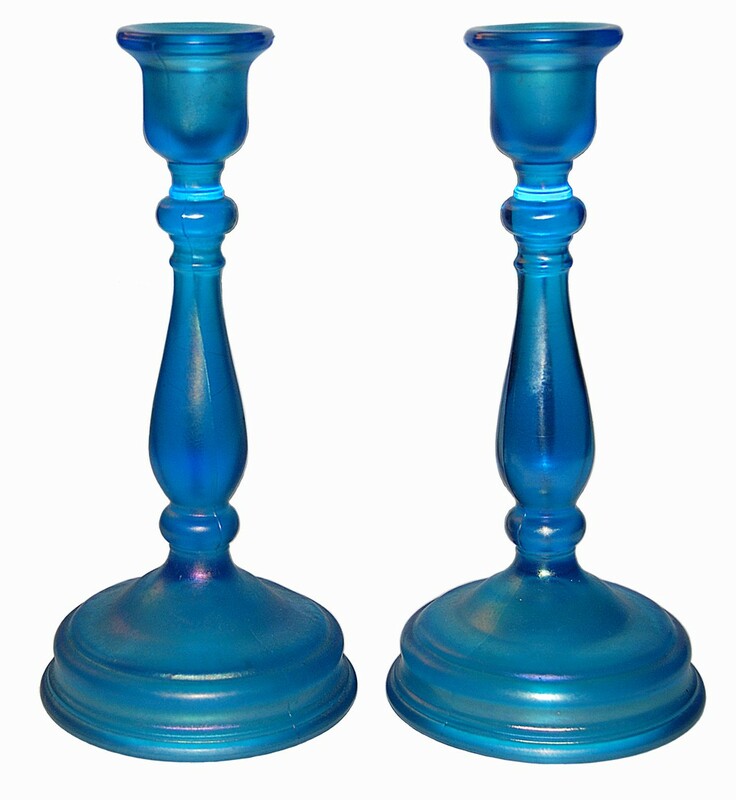 Our candlesticks are in Undamaged Condition without chips, cracks, or mold damage. The color is awesome. The iridescent effect is great. The eventual home of the Diamond Glass Company was built in 1892 in Indiana, Pennsylvania and operated as the Indiana Glass Company. Due to financial problems this company was short lived, and ceased operations in 1896. A few weeks later, Harry Northwood leased the factory and the facility operated as the Northwood Company. Northwood brought the Dugans back into the operation and the plant remained under Northwood control until 1899. In late 1899, the Northwood Company joined the National Glass Company and Harry Northwood and his family left the business and returned to England. The name of the factory was changed to the Northwood Glass Works and operation was controlled by the National Glass Company until 1904. In 1904, the plant was bought by a group of investors who formed the Dugan Glass Company. This company was managed by Thomas and Alfred Dugan and operated under their name until 1913. During this period the company specialized in high quality pressed glassware. Some of the more popular patterns were S-Repeat, Beaded Shell and Beaded Ovals in Sand. Glassware was produced in crystal and colors. Special treatments resulted in the production of enameled, silver filigree, opalescent and iridescent glassware. The Diamond Glass Company was founded in 1913 after the resignation of Thomas and Alfred Dugan from the Dugan Glass Company. The Diamond organization established a cutting shop and continued to produce the lines of glassware made popular by the Dugans. By 1916, the name of the company changed slightly to the Diamond Glass-Ware Company and Alfred Dugan returned as plant manager. Two important lines introduced in the 1920's were No. 900 (Adam's Rib) and Victory. Just as the company appeared to be recovering from the effects of the Great Depression, a fire destroyed part of the plant on June 27 in 1931. The plant never reopened.